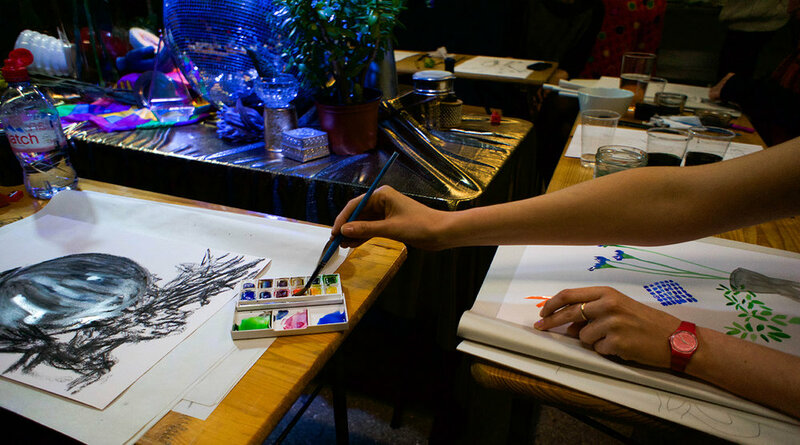 We run pop-up public and private workshops across London, in varying spaces, and we tailor the still life to the group. We provide the materials, illustrated tip sheets, and hands on advice. If you haven't drawn or painted for a while, or feel a bit intimidated stepping into an art shop never fear! A big part of the workshops is breaking down those feelings, and learning about the materials and tools you're using in an un-daunting way. Once we know what an 2B pencil can do for you as opposed to a 2H, we can start to feel much more confident in making the marks we want to make. We encourage trial and error, and give lots of relaxed demo's along the way. Although we hope you'll love what you walk out of the workshops with, it's not all about long extended super-detailed masterpieces. If you can draw what's in front of you in ten minutes, we encourage you to try and draw it in five. Then in 1, more often than not those looser free-flowing lines show much more and look great! You'll also find yourself loosening up and getting many more benefits from it than just from the page. We provide all materials for you to use on the night, as well as a curated kit for you to take home with you. These are what we think will help you get drawing at home, and continue that great feeling you get from the class. We're always on the look out for amazing art materials to use in our workshops, and in our kit, so get in contact at themarkmakers1@googlemail.com if you are an awesome art supplier! We use meditation and mindfulness techniques during our workshops, as drawing and making marks on the page can be an amazing way to clear your mind, and find some headspace. The aim at the end of the workshops are to be as relaxed as you can be, so the marks are looser and therefore stronger. We are taking part in yoga events across the coming year, where we'll tailor specific mindful drawing classes. Do get in touch, or have a look at our Events page to find out more.